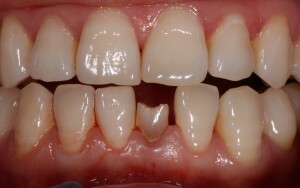 Here is an example of a Retained milk tooth (deciduous tooth) which has never been replaced with an adult tooth. 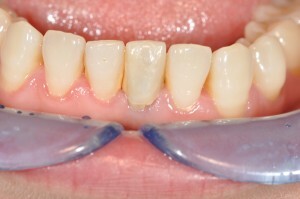 Over time the tooth has become loose and damaged. 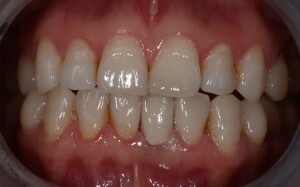 As can be seen from this photo the tooth is much smaller than the natural adult teeth. 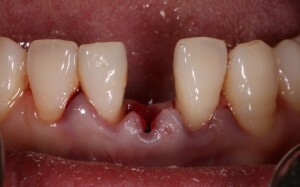 The patient decided that an implant was the best solution to replace the space once the milk tooth was removed. The milk tooth was removed painlessly using just local anaesthetic.The extraction was done very carefully in order to preserve the supporting bone. 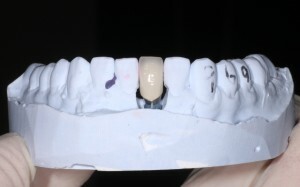 The bone area was then prepared for an implant to be placed. The patient opted to have an implant placed on the same day of the extraction and a provisional crown made immediately after surgery. 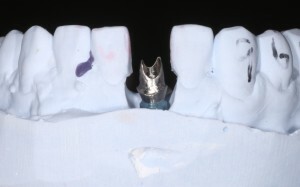 The crown in this case was a cement retained crown as position of the implant did not allow for a screw retained crown. In this case the customized abutment is positioned on the implant and the final crown is cemented with a specific implant crown cement. If you have a similar problem Contact Brighton Implant Clinic now for a free implant assessment or Call us on 0800 111 6623.